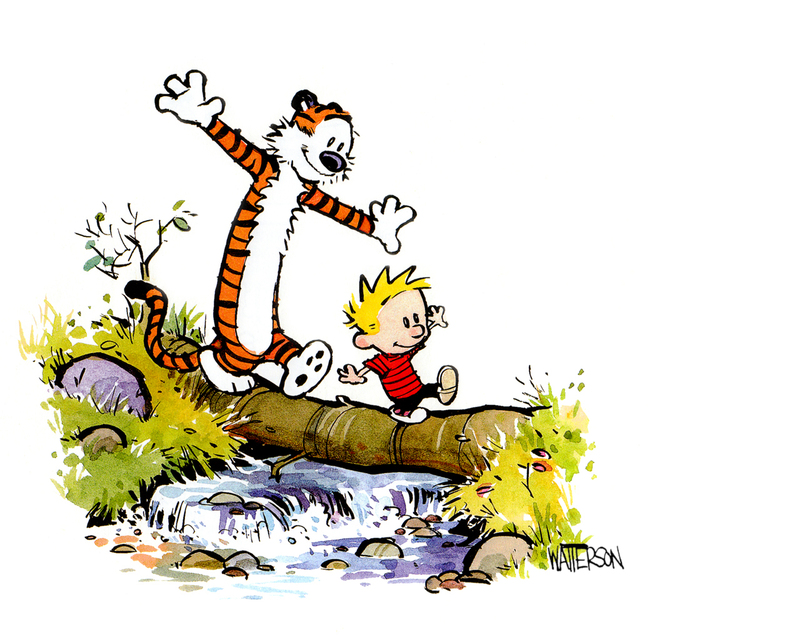 Now here’s an article for all the people in the world who have read, known, encountered, followed, believed, blogged, bought, stored, suggested, read all over again, loved and still love the awesome and most amazing Calvin and Hobbes. The most wonderful and amazing pair have been delighting the world for almost 27 years now. They are the greatest example of how much marvelous a good friendship is and just how precious your childhood is. Calvin and Hobbes are without a doubt the greatest comic strips ever produced, and i thank Bill Watterson from my heart for introducing them into our lives. 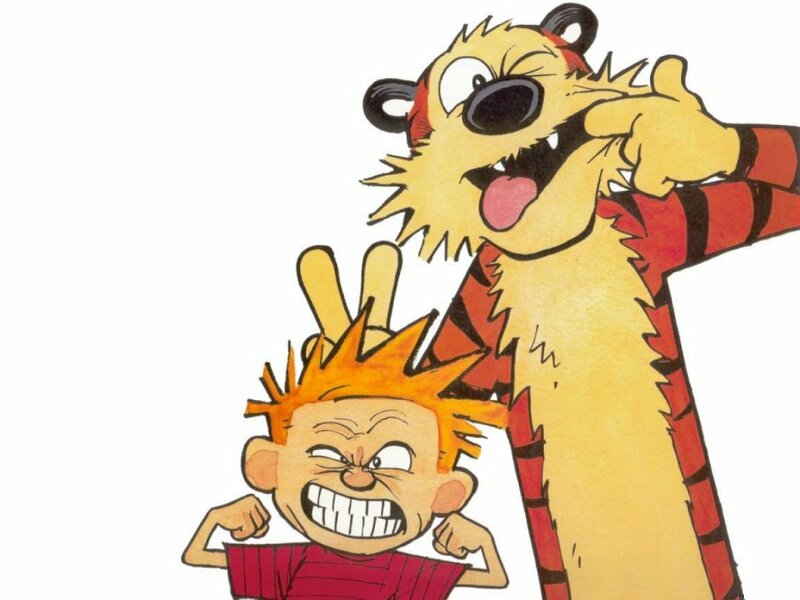 The main characters Calvin, the self-centered six year old boy, and his imaginary friend Hobbes, the tiger, are named after influential French theologian John Calvin and the English philosopher Thomas Hobbes. Calvin, although is shown to get bad grades throughout the comic, displays his intellect through his quick wits, sarcasm, and use of sophisticated words. The tiger, Hobbes, most of the times gives sensible answers to the eccentric questions of Calvin, which are obviously rejected by the self-centered and self-indulgent boy. The pair lives in their own world, made up mostly of walks on forest path, riding down the hills in wagon, sled or toboggan, playing silly games with rules made up on the spot, making snow sculptures in the weirdest ways imaginable or his vivid fantasies of being a superhero or a detective and sometimes even a dinosaur. I just tried to write honestly, and I tried to make this little world fun to look at, so people would take the time to read it. That was the full extent of my concern. You mix a bunch of ingredients, and once in a great while, chemistry happens. The duo will make you laugh, wonder, give you inspiration and wild ideas, make you contemplate about life and leave you craving for more. Why so many people like Calvin and Hobbes? Maybe because, the way Calvin questions morals and “obviousness” of society and the nature of life, and how Hobbes gives the insight, a tiger might have, on human nature, makes us ponder about the simple truths in life. This entry was posted on Friday, July 17th, 2015 at 5:06 am	and tagged with Bill Watterson, calvin and hobbes, comics and posted in Uncategorized. You can follow any responses to this entry through the RSS 2.0 feed. Music Therapy Now In Session!